The sun at last! 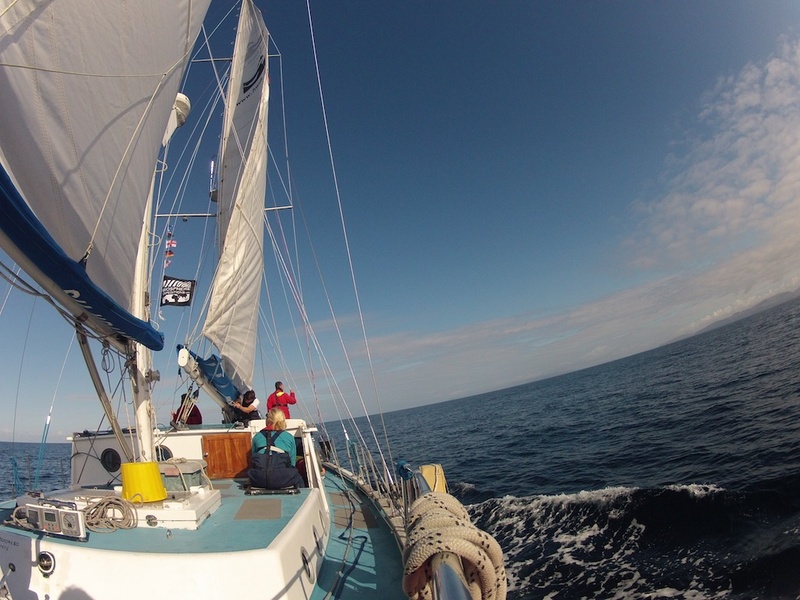 the final two days of the trip have been stunningly beautiful, we were all up on deck enjoying the the sunshine! Harbour porpoise sightings and sunburn to worry about! 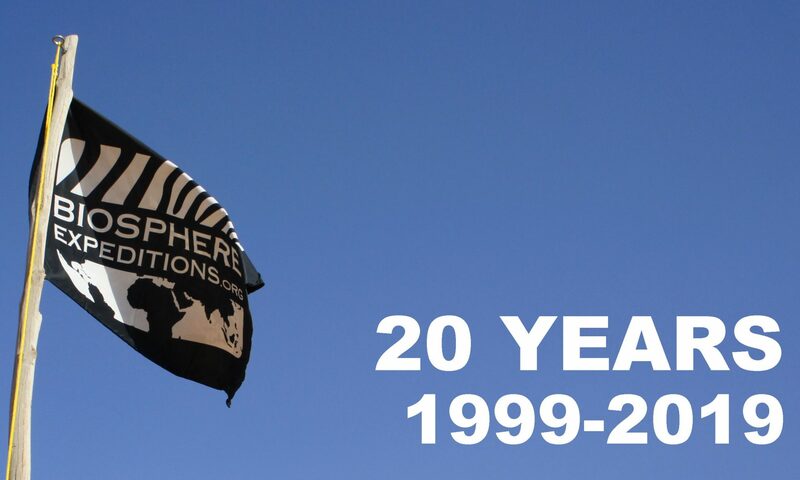 We travelled 366.9 miles through storms and sunshine, with 28 sightings of 71 animals including three orca! The whole team went out for dinner on the last night and in the morning we had the inevitable goodbyes. So this is the end of the Biosphere Scotland Hebrides expedition for 2013. The expedition has been a great success and I want to thank all participants for their efforts and contribution. Thank you also to HWDT staff and the crew of the Silurian for their efforts, as well as Swarovski Optik and BUFF(R) for their support. I am currently wrapping everything up for HQ and hope that you all had a safe trip back home. I hope to see you again some day on one of our expeditions. Well, since the last update we have had plenty of one thing, wind! This did not stop us doing a 45 mile survey yesterday in “roller coaster” conditions! It was the first bird and boat survey day, so we now know our kittiwakes from our fulmars. The Swarovski binoculars are really coming in handy, as is all the foul weather gear; in the classroom bird ID is fine, but out on the boat it is a little more difficult! The weather has made it hard to see our target species, they are here though, 28 individual harbour porpoise detections via the hydrophone and no sightings from the mast! Currently, with our Buffs over our noses, we are beating a path into the wind to get into Loch Torridon where we can get the survey back on track in more sheltered water amongst some spectacular Scottish mountain scenery. 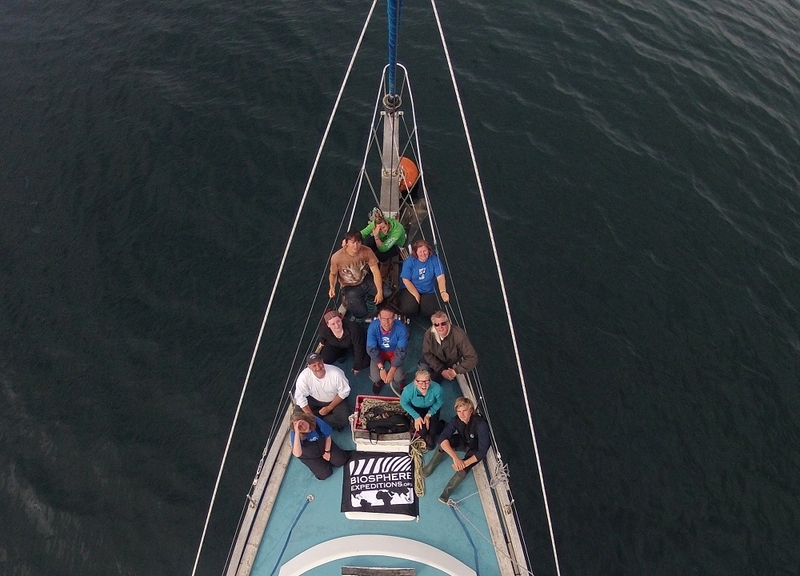 Welcome to the new (and last) team for this year aboard the Silurian! We have had a couple of nights on board already so everyone has had a chance to settle into their bunks. Yesterday was training day and Olivia filled everyone’s heads to a mush with information on how we are going to conduct our survey over the next ten days. The team shouldn’t worry though, there is plenty of time to practice! 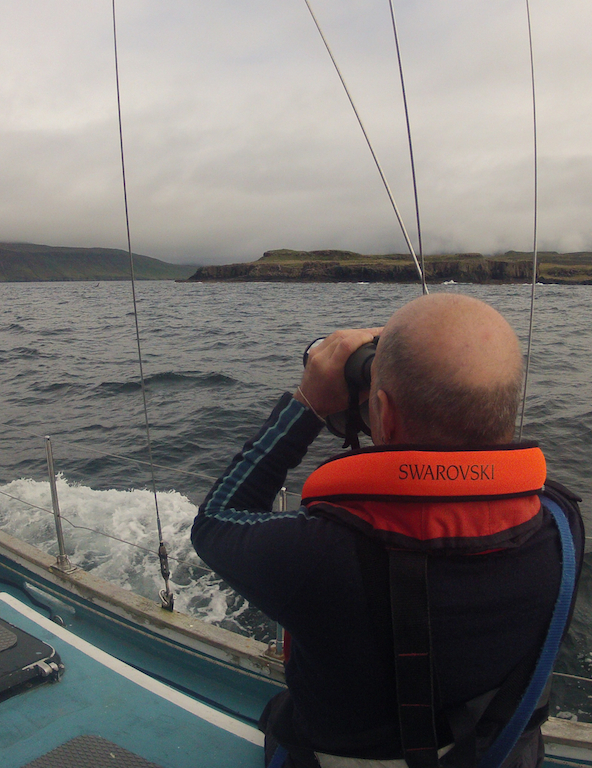 Our first half day sailing took us to the Island of Rum passing many harbour porpoise as well as a fleeting visit from a minke whale. 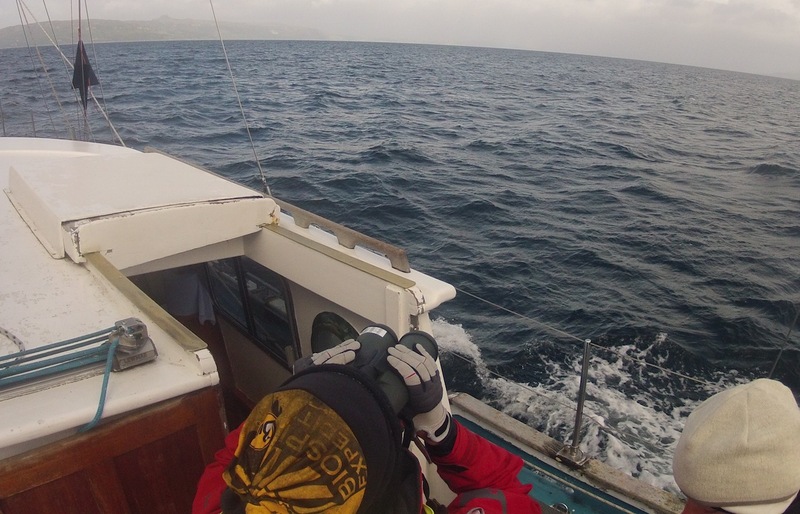 We did have a chance to go ashore onto Rum, mainly it seems, to be attacked by midges! Today so far has been very exciting, harbour porpoise sightings earlier followed by three orca heading northwest along the coast of Skye. It was immediately apparent to Olivia that the individuals are known to be from the Hebrides population; Lulu (female), Comet (male), Aquarius (male) (recognised from their dorsal fins). This is the first orca sighting form the Silurain this year, so we have been very lucky! We have had every type of wether imaginable and we are now back on our planned survey path to near the Island of Isleornsay. We will spend the night there before heading through the Inner Sound tomorrow. The last few days have been wonderful despite pessimistic weather forecasting. Plenty of harbour porpoise swimming around the inshore waters including a family of them playing around south of Kerrera island yesterday afternoon. We are currently slapping suncream on as we conduct our last survey en route to Tobermory and the harbour porpoise are out again. It is a shame it all has to come to an end, at least for group 3 tomorrow. Everybody worked extremely hard and have formed a formidable whale spotting team! This is down to excellent training from Olivia and commitment from staff and team members alike. We had fun too! 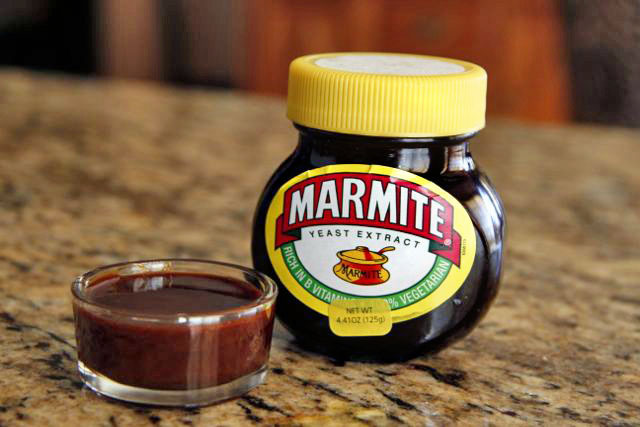 Our only failed objective was to bring James round to liking Marmite. He may still find we slip a pot of it into is bag for the journey back to the States! Our survey totals are, 411.1 miles covered, 103 sightings,172 animals, 105 harbour porpoise, 6 minke whales, 21 basking sharks, 7 grey seal, 16 common seal, 220 acoustic readings (219 were harbour porpoise), 263 creels and 41 pieces of litter. We will all be saying our goodbyes tomorrow morning after a send-off meal in Tobermory tonight. I hope the next team have been keeping up to date and know what to expect! I will send a diary update on Monday with details for the next group as it all starts for us again! 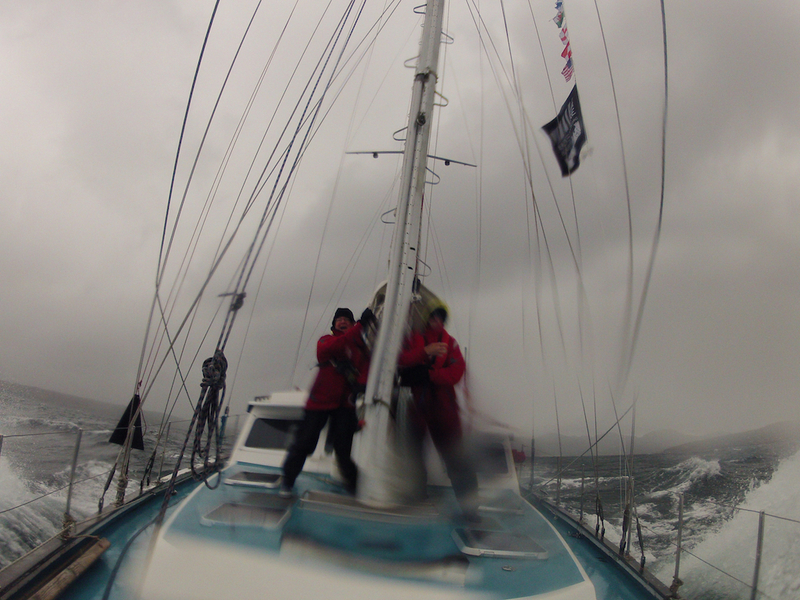 The last few days have been wet and windy making survey efforts very interesting! Usually this sort of weather would hamper our ability to spot our target species. However, the results have been quite positive. A few minke whale sightings have kept us on our toes and harbour porpoise sightings are still frequent. The hydrophone is showing up plenty of results, 33 separate porpoise clicks shown yesterday but only four sightings – this highlights the difficulty of spotting in rough weather. Delicious neeps, taties and (veggie) haggis were served for dinner last night. The tourist myth of a haggis being a live animal running around the highlands was truly busted after the flawed logic of eating a vegetable-based animal was exposed. Today we are heading down the Sound of Mull in the light drizzle and the first watch has been set. Everyone is in high spirits, we have formed a truly committed scientific team! After the excitement of the first day’s survey, Friday was relatively quiet with a few harbour porpoises sightings. Not that this mattered at all- we were bathed in glorious sunshine for the day and were treated to some fantastic views. 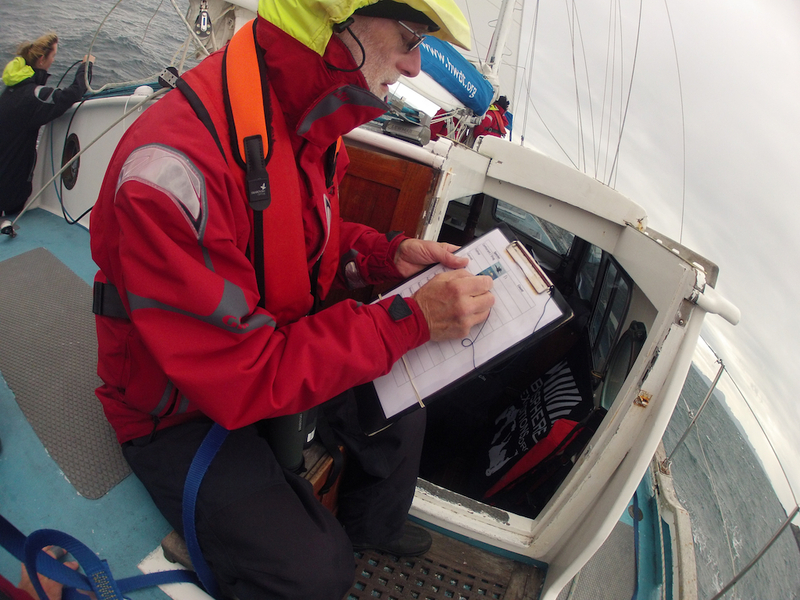 Fastidious listening to the shipping forecast by our skipper John provided news of an approaching low pressure system over Saturday. With gales forecast, we hunkered in a sheltered loch out of the wind as the drama in the open sea unfolded. Saturday was not, however, wasted. Talks from Olivia on the birds of the Hebrides would set up even the most unsure ornithologists for the bird surveys that were being introduced today. 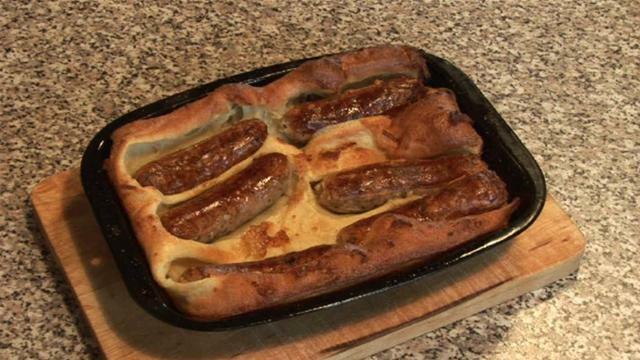 Manfred and James cooked us up a hearty British feast in the evening called ‘Toad in the Hole’, rather amusing the Germans and Americans among us, but delicious nonetheless (no toads were harmed, only some veggie sausages). As I am writing today (Sunday) it is business as usual. The weather is improving slowly and everyone is enjoying the challenge! 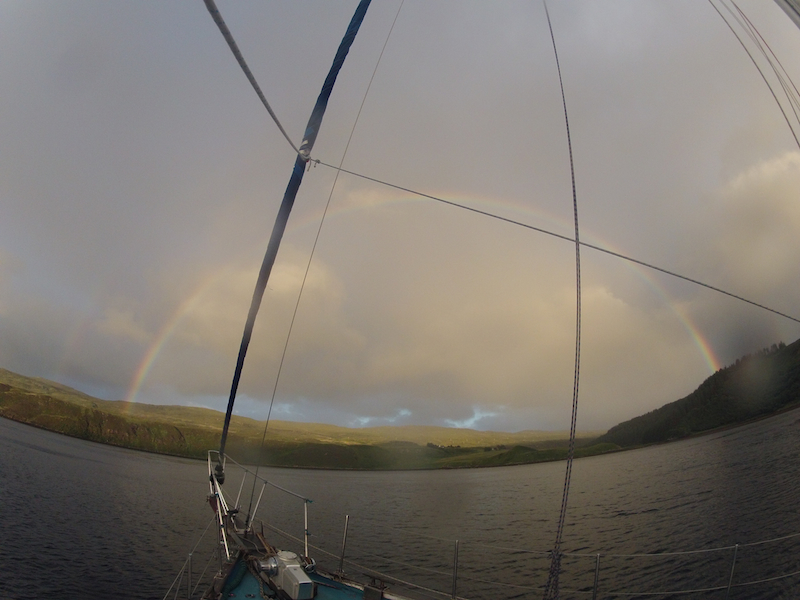 Here is the second update from the Scottish Hebrides expedition and I am writing this two hours after sailing northwest out of Tobermory. 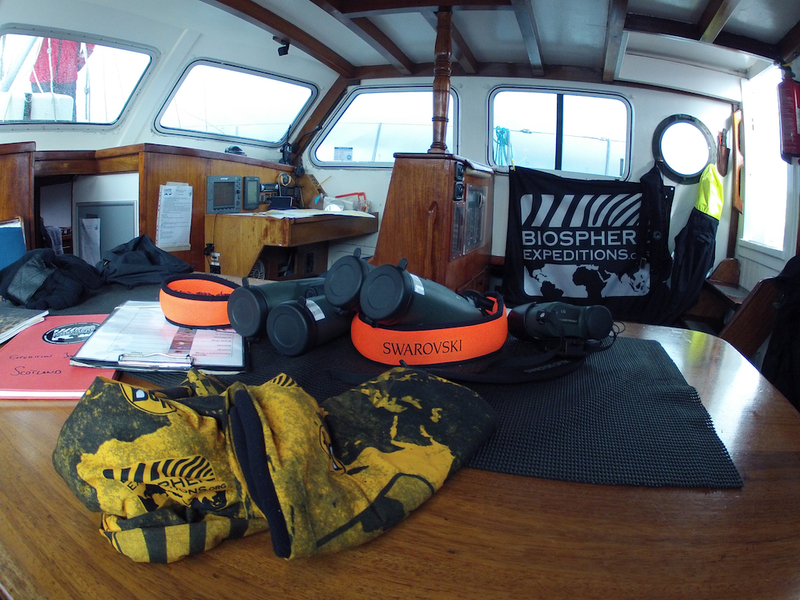 Yesterday the team settled into our living spaces onboard the Silurian. This morning was busy with some important briefings from Olivia on how the surveying is run on board. Now we are on our way, if the team wanted time for this all to sink in, they were sorely disappointed! Within half an hour they were put to the test. Two harbour porpoises were spotted off the bow and 15 minutes later, a basking shark. “With whales” was called (stop surveying) so we could go and have a look. It turned out to be a group of eleven basking sharks! As we continued our survey effort, there were more baskers every kilometre or so, the count is now about 21. Apparently this is an unusual area to see them in! I am struggling to finish this diary. I have to keep popping up onto the deck to see these pesky sharks! A few minutes ago a minke whale briefly came up for air 100 m from our starboard side. The team are making good use of our new optical equipment; a big thank you needs to go to Swarovski Optik for providing this for the expedition. It may not always be as hectic as this on board, we have had a very lucky first few hours. I will let you know in a few days how we are getting on. In the meantime, let’s hope the weather holds. Adam, your expedition leader, seen here on the Musandam coral reef expedition, is on his way to Scotland. 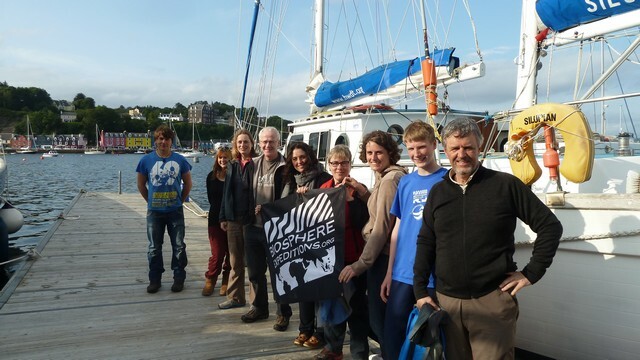 When he picks up this year’s team three in Oban tomorrow, we’ll have three expeditions in the field in parallel: Scotland marine mammals, Peru Amazon biodiversity survey and Namibia big cats & elephants. 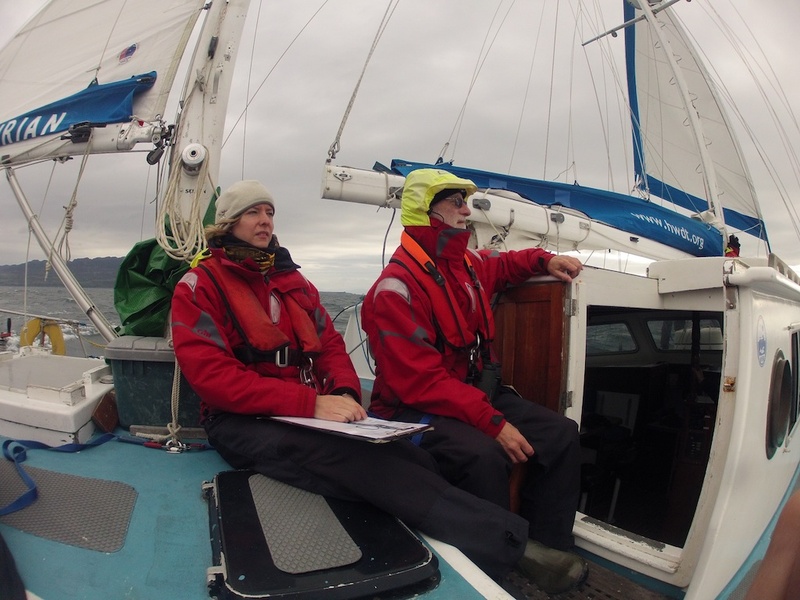 So after 10 days out at sea covering 404 miles around the Inner and Outer Hebrides we came back into Tobermory yesterday for our final meal together before saying our goodbyes to each other, the crew and our trusty yacht ‘Silurian’. Although the weather throughout was pretty grey, damp and windy and we were stormbound for one whole day, the wildlife was abundant – we had 56 separate sightings with 91 animals in total. This included 46 harbour porpoises, 1 basking sharks, 6 minke whales and 16 common dolphins. There were some really positive signs such as witnessing 4 minke whales “lunge feeding” for the first time in couple of years, which indicates that their habitat and food source has been restored, and seeing so many harbour porpoises (some with very young calves) which will support the current application for a Special Area of Conservation for that species. 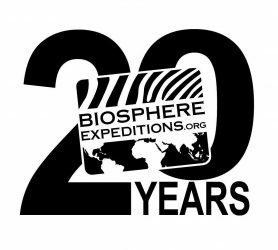 So a huge thank you to the expedition team for their contribution to this valuable work – Brian, Steve, Elke, Lena, Celine and Alex, the crew – Stuart and Tom for their professional handling of the boat, and our scientist Olivia for her education, guidance and teatime treats! We now go for a 5-week break and I hand over the reins to Adam as expedition leader, who will be in touch in due course. Enjoy the summer!